Although, I am pretty sure half of what we generally consider breakfast food, could borderline on dessert anyway. Like the difference between a cupcake and a muffin. The only difference I’ve found so far, is that a cupcake is covered in frosting, therefore making it “taboo” in the breakfast realm. 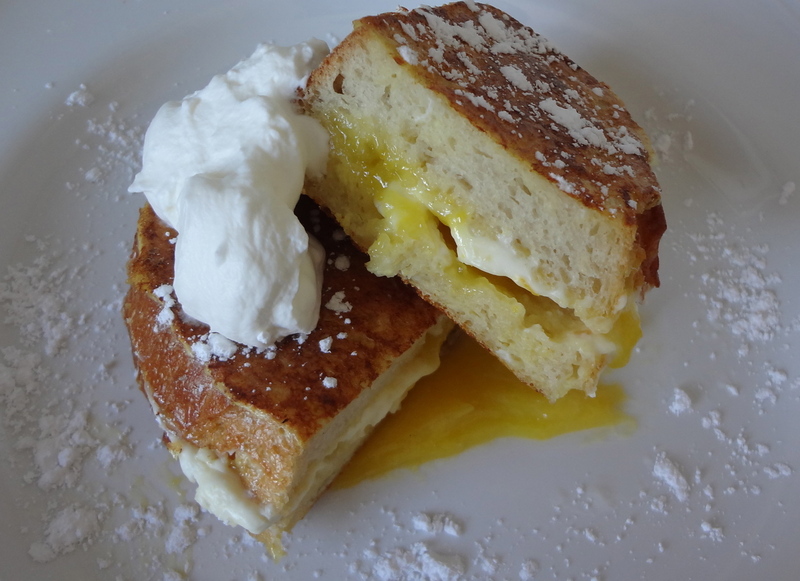 Well, stuffed french toast is sort of like that. Except still totally acceptable at breakfast because the frosting-ish bit is hidden on the inside. Like a sneaky dessert/breakfast surprise. 1. Heat a griddle to 350 degrees. Slice your bread in 1 1/2 inch thick slices. Using a small paring knife, cut a slit along the top of the bread, leaving at least 1/4 inch of bread connected on the bottom and sides. Think pita pocket, not hamburger bun. 2. Slice your cream cheese into thin slices, and gently stuff your bread pocket. Spread a layer of lemon curd over the cream cheese in the pocket, and press the open edges together to seal. 3. Combine your beaten eggs and the milk in a shallow baking dish, and whisk until just mixed. Soak your heaven-stuffed bread slice in the egg mixture, at least 30 seconds on each side. Grill until both sides are golden brown, and the inside is melted and gooey, about 2-3 minutes on each side. 4. Serve with powdered sugar, whipped cream, maple syrup, whatever you like. 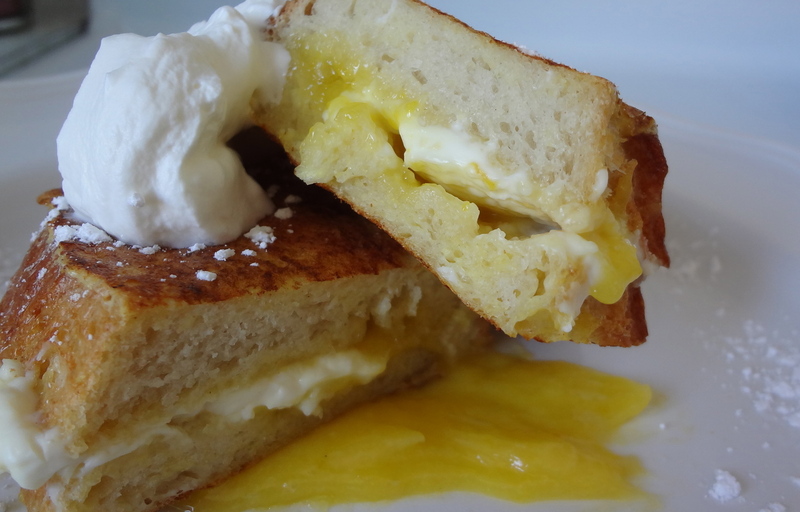 This entry was posted in Uncategorized and tagged Breakfast, brunch, easy brunch recipes, how to make french toast, lemon curd french toast, lemon stuffed french toast by theculinarycapers. Bookmark the permalink.